Has anyone any experience with Hermann's tortoises hibernating outside, in the UK? Funnily enough, i was just pondering the very same thing yesterday. Personally, i've not heard of this happening (others here may know different). Though with many a red-eared terrapin having already overwintered in the UK for many years and perhaps with future climate change proving conducive, i wouldn't dismiss the possibility. Tortoises, like many animals, are noted for having a good knowledge of their home range including that all-important, overwintering site. I wouldn't know what their precise hibernacula requirements are, but suspect one barrier to success might be finding a suitable location in an unfamiliar landscape. After asking around, it appears that many of them dig themselves into their chosen spot in the garden, I think by sense of damp and temperature, quite successfully. However, even though underground normally doesn't get too cold, if they get below app 5Deg C they can go blind or worse. I made an insulated box with a heater set to 5Deg C just just to stop that happening. I think it may have been a bit warm so far for comfort though. Another thing to bear in mind that they are heavy enough to stand the long winter here. Mine is ok. There is a weigh/length table to check. Also they should stop eating and 'clear out' app one month before bedtime. 'Experts' prolong the summer by bringing them into an area with a lamp which they artificially time to shut them down later in the year. This is my first time of tortoise hibernation, as the last one I got from a fair aged six, died not long after getting it. i am conducting a survey regarding chelonian welfare and was wondering if anyone would be able to fill it out! it will be used for my dissertation! many thanks ! I do remember as a child living on the Isle of Wight we had a tortoise that lived in the garden (it seemed everyone did in those days) - I don't remember it ever being brought in but it certainly survived at least a few Winters outdoors, probably under a shed or compost heap I guess. After 4xmonths of hibernation, which appears to be enough for my tortoise, and once the weather got warm, I woke her up. She's in a greenhouse. She didn't eat for a week, until I bought a reflector lamp, first 40W, which wasn't large nough to cover her in 30deg warmth, then 150W, which did. Once warmed up she ate ok, which I didd for a few days, then let her choose. If she comes out of her hut, I turn the light on and feed her, until it get warm enough, to let her into the garden. Thanks for the guidance to get her through my first hibernation. Living in the north of England we had to be very careful with the hibernation. The best place was indoors in an unheated cupboard (we had no central heating so the general temperature of the house was cool). A box of leaves (woodland tree leaves) was brought indoors and put in a cardboard box and dried indoors until completely dry, then the tortoise was put in and lightly covered in leaves. The lid of the box was closed when the tortoise had finally settled down (took a few days). Then the box was put under the stairs - or similar. The family had tortoises for almost fifty years and this started in the days of very cold prolonged winters. In fact we only ever had two tortoises and one of these lived to over forty. In about March we started to hear the tortoise rustling about in the leaves and the box would be brought out. Getting the tortoise to eat anything would be a problem unless he was bathed in a tray of luke warm water as well as bathing his eyes with clean warm water. He then seemed to come round and would proceed to eat - dandelions, lettuce, cucumber etc. A favourite food was buttercup flowers. 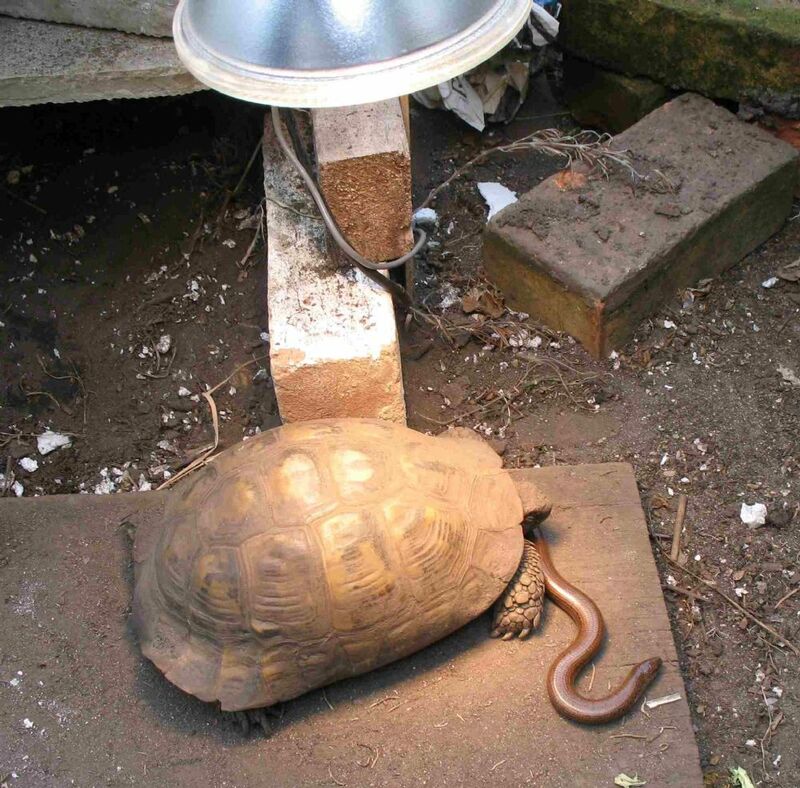 My cousins lived near Blackpool where it was much milder, and their tortoise overwintered in a box in the garage. I don't think ours would have survived that, nor digging themselves in to the ground as some do. I can remember as a child seeing boxes of tortoises for sale on Farnworth market. They were in open boxes priced according to size - some being very small. We weren't allowed to have one as a pet until we moved to the Lake District and had a large garden. When I lived in the north, my dad won a tortoise at a fair, but it had tics, and died fairly soon afterwards. I was only small so I don't remember much. Here in the south, it's difficult to keep them as cool as they should be, but my insulated boxes, rarely rose above 10Deg, so she only woke up a few times, which isn't ideal. Here she is today, with her new found sunbathing friend. I think they are probably more interesting than many people think. The main person who looked after our two successive tortoises was my mother. In fact she provided 99% of their care, despite them being pets of my younger sister. They knew her voice as she talked to them, and would approach her in their pen for food. They used to somehow scrabble up the wooden sides of the pen and angle themselves to get maximum sun warmth. As the sun went off them they would either move to follow the last rays or go into their little hut. Any fresh food was only of interest when it was just that, and buttercup flowers and dandelion flowers were ignored when a few hours old. If allowed out of their enclosure for "a run" both creatures always without fail set off in a certain direction. They knew when they were out and would set off in a determined fashion. On two occasions - once in the Lake District and once in Yorkshire - the tortoise escaped. Living on country estates with vast areas of woodland and fields the chances of recapture were very slim BUT in both cases they were found eventually. In the Lakes the tortoise was found in woodland by a dog belonging to one of the forestry staff where they were working. He was spotted carrying it in his mouth. It was known we had lost one, so he was soon returned. There was a very small piece of his shell missing and his shell was bleached by the weather, but that seemed his only marks of the adventure. We always pondered his route as there were fine mesh wire fences and a cattle grid to negotiate. He ended up over a mile from home on some very high ground. I'm not so sure of the details of the second escape in Yorkshire, but again cattle grids, and stone walls along the route. When my parents died ten years ago the tortoise went to a wildlife park as I didn't feel I could look after it properly and my siblings didn't either. The hibernating was what I feared most.